Scott Stratten is the President of Un-Marketing. He is an expert in Viral, Social, and Authentic Marketing which he calls Un-Marketing. He has over 114,000 people follow his daily rantings on Twitter and was just named one of the top 5 social media influencers in the world on Forbes.com. Rumor has it that it’s the only time he’s felt comfortable being compared to Ashton Kutcher, P Diddy and Justin Bieber. He is also the author of the book “UNmarketing: Stop Marketing. Start Engaging”. The book delves into the shift in today’s business world and how a marketing shift is necessary. While Scott is most known as a top Twitterer (is that a word?) and as a social media guru his book covers many realms of marketing and is filled with useful case studies to drive home his point. Whether you want to broaden your understanding of social media for business or want some solid advice on everything from your online newsletter to how to online customer service this book will deliver. This is an easy read that will keep you laughing as much as learning. With chapters like “Why Networking Events are Evil” it’s hard to go wrong!! 1. 5 steps to success on Twitter: Follow, Reply, Retweet, Share, Repeat. 2. Don’t try to win over the haters. You’re not the jackass whisperer. 3. Give away some knowledge. People fear that if they give it away, people won’t need to hire or buy from them. If everything you know about your industry can be explained in a few articles, you don’t know much. 4. If you want to evoke emotion, it’s internal emotion for the reader, not the writer… If someone reads your tweet or blog post, or sees your video, and the only thing they learn is more about you, you’re not evoking emotion. That’s an ad. If you want to persuade people and get them to pass something around, evoke their emotion. 5. For generations, marketing has been hypocritical. We’ve been taught to market to others in ways we hate being marketed to (cold-calling, flyers, ads, etc.). So why do we still keep trying the same stale marketing moves? 6. Twitter is a conversation. It’s truly what I love about it. 7. Facebook is in a world of its own. Posting on someone’s wall with a seven-line signature, mass-inviting people to every event (even if…the person is not even in the same country), to tagging people in articles that they are not even mentioned in just to get them to read it. There is a special vein in my forehead that you can clearly see when these things occur. 8. It’s not just knowledge people buy from you, it’s the application of the knowledge for their specific situation. 9. If you believe business is built on relationships, make building them your business. 10. Marketing is not a task. Marketing is not a department. Marketing is not a job. Marketing happens every time you engage (or not) with your past, present, and potential customers. 11. Satisfied customers are the best way to market your business, because they are the ones that become your word-of-mouth army – they are your customer evangelists. 12. Stop Marketing. Start engaging. 13. Don’t just tell people you have the answers to their problems but make them put complete trust in you and hire you to give them the answers, but five them the answers. Show people you are an expert in your field. 14. The day you start talking to your audience and it’s about them, that’s the day that business really happens. 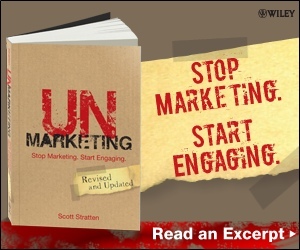 If you have not taken the time to read his book I suggest you at the very least follow him on twitter @unmarketing. If you have read the book be sure to share your favorite Scott Stratten quote below. P.S. 15. You have to be an expert to run your own business. This entry was posted in SEM, SEO, SMM, ZD White Wall and tagged facebook, scott stratten, SMM, social media, social media marketing, twitter, twitter marketing.